I’m a big fan of King’s recent works as of late. Revival is probably my favorite King novel at the moment, and I loved Mr. Mercedes. 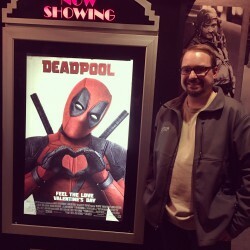 I was surprised to find out that he’d make it a trilogy. And let me tell you, Finders Keepers delivers. At least from where I stand. 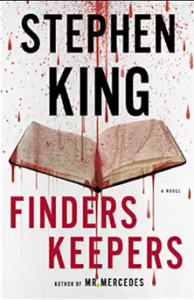 Almost like a love letter to books and writing, with bits of blood and gore sprinkled here and there, King delivers a thoughtful and engaging thriller that doesn’t rely on non-stop action. Lots of character development. Once again, King delivers the goods when it comes to creating a horrible yet frighteningly real bad guy. Even though this is known as The Bill Hodges Trilogy, you may find yourself surprised that Bill, Jerome, and Holly are in this very little. The meat of the book deals with Morris Bellamy and young Pete Saubers. My heart broke for Pete and his worries, and I was absolutely disgusted and intrigued by Morris. It could be the book lover in me, but I actually think I might’ve enjoyed this one a little better than Mr. Mercedes. This one definitely spoke to me more. And I totally want King to come up with fake Jimmy Gold books now. Will Patton does a terrific job with the audio book once again. I highly recommend going this route. Hell, it might’ve even influenced my rating just a tad. I’m not sure if I’m mentally ready for the last book in the series, which just came out. I don’t want this to end. I’ve found myself invested in the characters. Finders Keepers is another winner from King and it shows you that he hasn’t run out of tricks yet. He’ll continue to write things you won’t expect. And thank gawd for that!